Once upon a time in the middle of the Pacific Ocean there was an island kingdom; a land of islands ruled by kings and queens. . . a Land we now call ‘Hawaii’. . . Visitors who spend anytime in Hawaii will soon be caught up in its history and the stories of those who ruled that not-so-long-ago Kingdom. Reminders and tributes are everywhere from the Kamehameha Highway to Queen’s Hospital. Among the Royalty were – just to name a few -- King Kamehameha, also known as Kamehameha the Great, who conquered most of the Hawaiian Islands and formally established the Kingdom of Hawaiʻi in 1810. . . and Queen Emma, consort of King Kamehameha IV. . . and King Kalakaua, and finally Queen Lili’uokalani the last reigning monarch of the Kingdom of Hawai’i. She reigned until the overthrow of the Kingdom in 1893. The history of the Kingdom, the arrival of Christian missionaries, the introduction of sugar cane and pineapple production, its tourism industry and the road to statehood in 1959, is multifaceted. Today I am focusing on one small but important part of its fascinating story . . . If you look closely at my photo above you’ll see the iconic Royal Hawaiian Hotel, ‘the Pink Palace of the Pacific’ tucked away in the shadow of modern high-rise hotel towers. What a contrast to when she reigned over Waikiki Beach as shown in the photo below. The Grand Old Queen of the Beach celebrates her 90th anniversary this month. The first Royal Hawaiian Hotel was originally built in downtown Honolulu to house visiting dignitaries. Opening in 1871 it was called the Hawaiian Hotel, then soon after King Kalakaua came into power in 1874, it was called the Royal Hawaiian Hotel. In the early 1900’s, with the hotel in decline, the YMCA took over the building and Matson Navigation Company bought the name. Opening at its present-day Waikiki location on February 1, 1927, the new Royal Hawaiian Hotel drew 1,200 attendees to its opening night gala. The hotel’s Spanish-Moorish style was popular in the 1920’s, partially due to the popularity of Rudolph Valentino, an Italian actor who often portrayed Arab sheiks in movies, according to Bob Sigall, who writes “Rearview Mirror” for the Honolulu Star Advertiser Sunday Magazine. Those early day cruisers after being welcomed with leis and serenaded by the Royal Hawaiian Band at the pier were treated to a lawn party at the hotel. While guests partied, servants unpacked their bags, according to Sigall. During World War II tourism tanked. The luxury cruise ships were painted war-time gray and became troop transport ships while the Navy took over the Royal Hawaiian, paying $17,500 a month rent. The hotel was then used for a Rest and Relaxation (R and R) facility for troops. It didn’t take long after the war for tourism to return and the hotel reopened to resume hosting the luxury traveler. Hawaiians like to ‘talk story’ and among the hotel’s stories is one explaining its pink color: it was inspired by the colors of homes in Portugal, many of which, back in the 1920’s, were painted pink with blue shutters. 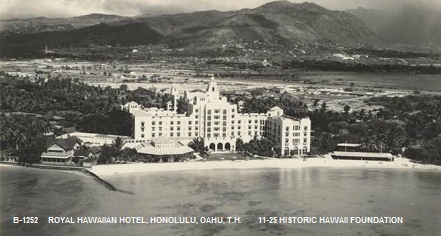 A look at the history of the ‘Pink Palace’ wouldn’t be complete without mention of the Waikiki ‘beach boys’ – those talented and athletic young Hawaiians who taught visitors how to surf and to use outrigger canoes. There’s a photo display at the hotel that pays tribute to one of their favorite ‘beach boys’: William ‘Chick’ Daniels (1899-1982). Chick, as he was called, began his 50-year career at the Royal Hawaiian in 1927. He became their Head Beach Attendant. This talented waterman was also a musician and entertained guests by day then performed with his band, the ‘Royal Hawaiians’ at night. They performed at the hotel’s opening gala. Years later, he wrote the Hawaiian song, “Lei Aloha” which he performed in New York on the Arthur Godfrey radio show. It was a different time, those glory days of luxury in the ‘Pink Palace’. The price of a ticket to that that opening gala cost $10 per person, or about $150 by today’s standards. But it’s not too late to have a taste of the elegance: The hotel’s 90th Anniversary Gala is slated for March 3rd, tickets are $350 per person with all proceeds going to the ALS Association. The event, housed in the hotel’s elegant Monarch Room, will include a cocktail reception, three-course meal, entertainment and silent auction. Tickets are still available. For information: royalhawaiian90thgala@luxurycollection.com or (808) 931-7912. If you want a bit more ‘talk story’ about the ‘Pink Palace’ the hotel’s historian, Kehaulani Kam, leads one hour tours twice a week. They currently begin at 1 p.m. Tuesdays and Thursdays. Contact the hotel for details, (808) 923-7311. Aloha for this week. If you have a story about the Royal Hawaiian we invite you to tell us about it in the comments below or send us an email and we’ll add your story. The hotel wants to hear your memories, so hashtag it, #Royal90. May your travels be happy and healthy! Hope you’ll be back next week and bring a friend or two with you. It was good to hear the story of the hotel. I bet it has a million stories to tell of it's transition from luxury hotel to R & R for the Army, and back again. This is definitely one of those places that I think 'if those walls could talk. . .' Thanks for stopping by, Jan. I remember reading James Michener's book "Hawaii" (probably in the 70's!) and being utterly captivated by the paradise and people he described. Moving forward a few hundred years, it's fascinating to see the change in the skyline where the Royal Hawaiian Hotel exists and it's not hard to imagine it when it first opened. Sounds lovely! Funny you should mention that book as I was thinking I should re-read it again sometime. It is kind of sad to see it wedged in among high rise buildings these days but it still holds some magic, that's for sure. I love that old black and white photo of the Royal Hawaiian. We share a love of Hawaii then. Thanks much for stopping by, hope you'll be back often! Oahu is my favorite Hawaiian island. Waikiki Beach is a really fun place and the Royal Hawaiian looks wonderful. I'll definitely check it out next time I go! You definitely need to stop by the next time you get to Waikiki - it is a treasure in an otherwise overcrowded with tourist part of the island. Thanks for stopping by! Those ceilings, beautifully sculpted, so ornately designed, the columns, the light fixtures...another era! Thank you for introducing me to the Waikiki Royal, a.k.a. the Pink Palace; they just don't make them like this anymore, do they? No they don't Poppy and I find that so sad. I look at some of the sleek modern structures that will be knocked down in a couple decades to make room for newer structures and it makes me sad that architecture has become a cost-energy efficient endeavor without thought of long-lasting history or beauty. Just got back from a stay at The Royal Hawaiian. I think that was my favorite part of my trip to Waikiki beach. (I had never been to Hawaii before, and thus didn't know what to expect. We started in Maui, ventured off to Lanai'i and Molokai, then ended in Oahu visiting both Waikiki and the North Shore. Waikiki was a sharp contrast to all of the other places we visited in Hawaii.) While I'd happily visit the Royal Hawaiian again (they made me feel like royalty even though I was in the cheapest room they had available), I'm not sure Waikiki would top my list of favorite places to visit in Hawaii. Thanks for sharing the history of the hotel. One day I may have to return if only to take the tour. It sounds like a fun and informative experience. Will you be going to the anniversary gala? Oh we so agree with you about Waikiki - we sadly try to avoid it these days. Way too crowded with tourists, shoppers and street people. And over the years it has lost its tropical charm to ubiquitous high-end stores that make its streets look like any big city in the US. But on occasion we brace ourselves and go there, just so we can go to the Pink Palace. And no, we are back in the Northwest, so won't be attending the gala. Thanks for sharing your travels, come back soon! Our friends loved Hawaii when they visited, we're yet to get there yet, so thanks for the visit. So interesting to see the then and now. Happy travels and have a fabulous week doing things on your 'to do list" ! We find it so interesting that so many from "Down Under" come visit Hawaii. Your part of the world is so beautiful and you have such gorgeous beaches that we wonder why any of you would want to come to Hawaii. Thanks much for stopping by. I remember walking through the Royal Hawaiian when I was a kid and admiring how the pink really stood out. On that trip, I was also really happy we were staying at the Sheraton Waikiki because I think that's where The Brady Bunch stayed when they visited Hawaii. We've just decided to head to Oahu this summer, and I'm hoping to get another look at this grand hotel. Oh you should take the free tour while you are there this summer! Enjoy your trip no matter what you do or where you go. What a grand old lady she is! I can't believe how much the other buildings are overshadowing her now with their size. But, despite all that, she is still standing out as the one who the most style! She is a classy old dame, isn't she? Proving again that even with age, if you have style, you'll stand out in a crowd!! Thanks for the visit Birgit - just stopped by your blog and it is great! What a beautiful location Jackie. So different from Greece and althougth they are also islands the mood is totally different and more atmospheric with the lush greenery and the deep greys of the sky. The hotel is grand and full of history. Oh Mary you are so right about the differences. And we so love the colors of Greece but as you've noted there is something different about the colors of Hawaii and the tropics that we also adore. Luckily we are blessed to be able to experience them both. Thanks for stopping by. My father-in-law was stationed at the Royal Hawaiian during the Second World War and the stories and photos he shared with me spoke of an oasis of peace and R&R far away from the realities of war elsewhere. Thanks for bringing those memories back to the fore! I love reading about Hawaiian history, I had read about the Royal Hawaiian before, thanks for the refresher. I love the Royal Hawaiian hotel. I recall fondly when I stayed there, quite a while ago, and was greeted with a lei when I arrived, and then enjoyed their fabulous banana bread right in the sand on the beach along with coffee the next morning. It is definitely time for me to return.